"And they have built the high places of Tophet, which is in the Valley of the Son of Hinnom, to burn their sons and their daughters in the fire, which I did not command, nor did it come into My heart." Any day now, they’ll kill Charlie Gard. Charlie Gard, born last August, suffers from an inherited disease called infantile onset encephalomyopathic mitochondrial DNA depletion syndrome, generally referred to as “MDDS.” The disease is extraordinarily rare: At present, there are only 16 known cases worldwide. Most patients who suffer from it die in early infancy. Charlie is unable to breathe unaided, suffers from seizures, and has severe brain damage. For ten months, Charlie has been living in the intensive-care unit at Great Ormond Street Hospital in London. In March, his doctors decided that there was nothing more they could do for him, and they recommended that his parents, Connie Yates and Chris Gard, withdraw his ventilator. They refused, on the grounds that an untried experimental treatment was available in the United States. The hospital, in accordance with British law, applied to the courts to forestall further treatment. In April, the High Court found for the doctors and against the parents. In May, the Court of Appeal upheld the initial decision. In early June, the Supreme Court agreed. And this week, the European Court of Human Rights — the last court of jurisdiction — refused to intervene. Charlie’s parents have raised enough money from private donations to fund the experimental treatment, but the court decision prohibits his removal to the U.S. Whenever they see fit to do so, the doctors at Great Ormond Street Hospital can now remove Charlie’s life support. Yes, it's as awful as it sounds. But...did you know that Hospitals in Texas have authority to do basically the same thing?!? Under current law, hospitals in Texas are allowed to place "Do-Not-Resuscitate" orders on patients without their consent or, in the case of minors or the incapacitated, the consent of their next of kin?!? It's not required by law to have patient consent for a DNR order. Patients have secret DNR's placed on them without being informed. A doctor an put a do-no-resuscitate order on a patient against their will. During this past regular legislative session, HB 2063 was filed by GREG Bonnen. It was a five paragraph bill that would have required hospitals to obtain patient consent before issuing a DNR. Unfortunately, after it was slow walked through Byron Cook's State Affairs committee and Todd Hunter's Calendars committee, it was died late in the session after House leadership attempted to use it as a legislative hostage to grease the skids for a variety of special interest bills. Yes, that's as awful as it sounds. 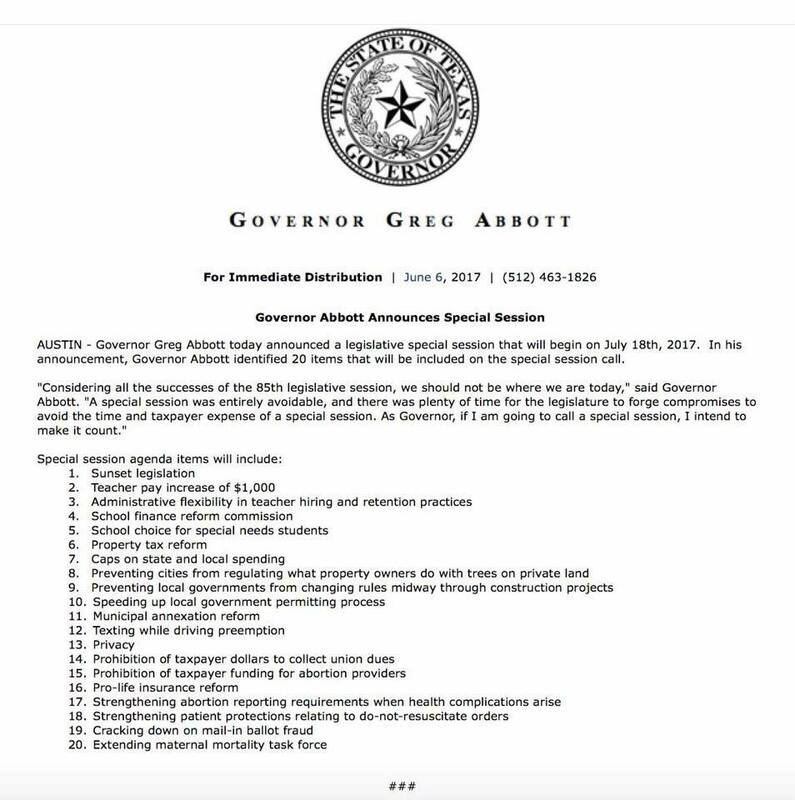 Fortunately, we have a second chance: Governor Abbott made "strengthening patient protections relating to do-not-resuscitate orders" a special session agenda item. It'll be interesting to see how Byron Cook and Todd Hunter act the second time around. Bottom Line: Involuntary do-not-resuscitate orders have always been horrific, but this week's news out of the UK re-illustrates the urgency of the issue. "Then the Lord God took the man and put him in the garden of Eden to tend and keep it." After a closed-door discussion Thursday, Austin City Council members agreed to waive $6.9 million in fees and provide other assistance to the state for a new Capitol Complex — a topic that had drawn wry skepticism during a council workshop earlier in the week. The Capitol Complex is a planned $581 million three-phase project to convert North Congress Avenue between the Capitol and the University of Texas into a grassy pedestrian mall. The later phases will create new office buildings for state workers at 16th and 18th streets. Work is expected to begin this summer. The 6-2 vote Thursday, with two abstentions and one council member absent, authorizes city staffers to draft an interlocal agreement with the state to waive fees for the first phase of the Capitol Complex project. It would also provide expedited permitting for the project, appointment of a city staff project team and an agreement that the city will vacate four blocks of North Congress Avenue and convert 16th, 17th and 18th streets to two-way traffic. There's so much to say about why this is a terrible idea, but we'll start with a personal observation we made numerous times throughout this past regular legislative session. If you walk around the area north of the Capitol Grounds and south of UT campus after 6pm, you quickly notice that it's a dead zone once all the state employees go home at night. Having a dead zone between two of the most robust neighborhoods in the city (Downtown and Campus) is one of the worst missed opportunities we have for land use in this city. As we made that observation over the past few months, we've come to an increasingly obvious conclusion: the State of Texas should sell that land (or, at a minimum, do a long-term ground lease) for mixed-use residential/commercial development. Beyond that, there's the city of Austin's chronic housing shortage. If this area were properly re-developed, you could get 10,000 additional units of housing supply in a desirable location, which can only lower housing costs citywide. And the best part is that you wouldn't have to displace any current residents, because there aren't any current residents. Then there's the traffic consideration. The primary driver [Note: Pun not originally intended, but left in place after being recognized] of traffic on I-35 is state employees commuting to and from work. Getting all those state employees off of I-35 and replacing them with people who aren't travelling long distances to their job can only ease traffic congestion. Then there's the cost: $581 million to build luxury office towers for state employees. One thing we learned during the Courthouse bond campaign two years ago is that construction costs in less prime locations are a fraction of construction costs on prime real estate. If this project moves forward, it's safe to predict it'll cost twice as much as advertised, take twice as long to complete as predicted, then once the project belatedly opens the buildings will rapidly depreciate to the point where within 7 years they'll need another infusion of cash for "maintenance." Finally, of course, there's the ongoing nightmare of the city of Austin's fee and permitting process. We've long been of the belief that the city needs to streamline fees and permitting for everyone and end the constant stream of "fee waivers" and "expedited permitting." That the state of Texas was able to obtain special treatment is yet another example of how politically favored entities receive accommodations which are unavailable to the rest of us. Thursday's council meeting is the last time to increase the exemption before a mandatory state deadline; Troxclair couldn't get 4 co-sponsors to get it on the agenda. Almost all of the current council campaigned on this issue. It was Adler's #1 affordability issue in 2014. Adler: Blah blah, "too much budget uncertainty." While this is disappointing, the truth is that homestead exemptions are band-aids on bullet wounds, so the net impact is minimal. The property tax discussions currently underway in the legislature will have far more of an impact on the average homeowner in Austin than whatever council does this week. That being said, 2018 is a council election year (with the Mayor being up as well) and we suspect they'll find a way to make significant headway on this issue then. Oh good grief...will he start crying?!? Today, Rep. Drew Springer (Muenster) sent a letter to Governor Greg Abbott requesting that the special session call be expanded to address funding for small, rural school districts. 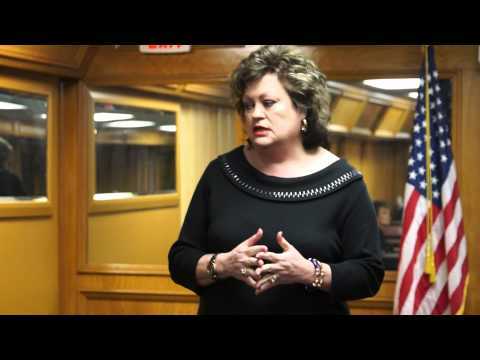 As a representative of 22 rural counties in north and west Texas, Rep. Springer is well-aware of the devastating effects that the funding shortfall will have on small school districts and has stressed the need to continue funding for these schools. The letter was also signed by Rep. Ken King, Rep. Dustin Burrows, Rep. Poncho Nevarez, and Rep. Ryan Guillen. When asked about his letter the representative responded, "The reality of the situation is that with the loss of funding several of our small, rural school districts are being forced to close their doors or provide a lesser quality of education than the majority of other schools around the state. A few of these districts serve an entire county and it is impractical to force them to close, only to bus those students over an hour away to another ISD in another county. We owe it to the children of Texas to ensure that these schools stay open and that the state doesn't overlook our rural communities." This past session, both the House and the Senate offered legislative fixes to compensate for the expiration of Additional State Aid for Tax Relief (ASATR) funding for public education (effective September 1, 2017). Unfortunately, due to differences between chambers the legislature was unable to pass these measures. This ultimately sends small school districts, especially those that are the only providers of public education for a county, barreling toward a fiscal cliff. Currently in Texas there are twelve school districts that are the only district operating a campus in an entire county, eight of which will experience cuts from four percent to as much as forty-three percent in their Maintenance & Operation (M&O) revenue per average daily attendance. First things first, school finance is already part of the special session agenda, dimwit. Two: Your crocodile tears about "Rural Communities" would ring a lot less hollow if you hadn't actively sabotaged tax relief for everyone statewide during the regular session. Three: Poncho Nevarez?!? Seriously, Poncho Nevarez?!? In other words, after a liberal Democrat threatens violence against your Republican colleague...your reaction is to attempt to rehabilitate the Democrats reputation?!? Four: The current school finance system is a gigantic act of redistribution from the urban areas of the state (and a few areas with oil) to the rural. Note: The chart that explains this phenomenon can be found on page 19 of the report linked above. Bottom Line: This would be embarrassing if these people were capable of shame. "And the merchants of the earth will weep and mourn over her, for no one buys their merchandise anymore"
Going forward, Wallace said [the Texas Association of Business] might have reason to change its tune on another key bill for the legislative session, Senate Bill 2, which would restrict the growth of property tax rates at a municipal and county level. TAB, which has previously been neutral on the topic, is holding a board meeting on Friday, and will likely discuss the topic there. Wallace said the savings lawmakers are touting for SB2 might not be as significant as some in business originally thought. He said the savings doesn’t pan out when compared to the risk cities, counties and community college districts take on with a capped amount of revenue they can take in each year. Until the TAB board of directors reevaluates its stance on SB2, the group is imploring lawmakers to revisit school finance. Indeed last session, in an attempt to derail a relatively modest piece of property tax relief, TAB instead backed a dopey scheme to cut a sales tax about which nobody is complaining. But the lazy man will be put to forced labor." A couple interesting press releases out of the Governor's office this morning. In the upcoming special legislative session, Sen. Kelly Hancock, Reps. Tan Parker and Mike Schofield will file legislation to limit the growth in state spending to no more than the growth of population and inflation. This is one of 20 items that Governor Abbott previously announced will be added to the special session agenda. In the upcoming special legislative session, Sen. Craig Estes and Rep. Jason Villalba will author legislation to limit the growth in local spending to no more than the growth of population and inflation. This is one of 20 items that Governor Abbott previously announced will be added to the special session agenda. Estes and Hancock both have histories of sometimes doing good things and sometimes doing bad things. Thus it's not surprising that they're doing this. Good on them both. Schofield carried a similar bill during the regular session, thus his presence isn't surprising. Tan Parker carrying the state level bill is very interesting. Parker's previous shortcomings as GOP conference chair have been well documented. We suspect Abbott has taken Parker to the woodshed, but regardless the dynamic of seeing Parker caught between Abbott and Straus will be very revealing. Villalba carrying the local bill is...disappointing. We suspect he'll try to push a bill with more loopholes than Swiss cheese. This bill might very well need to be fixed via floor amendments. That being said, there's a certain savvy in working with House members of have historically been supportive of leadership, but not part of the inner circle, that could make life very uncomfortable for Joe Straus if we get 8 or 9 days into the special and bills aren't moving. Bottom Line: We'll have to see what happens, but today's announcements strike us as a reasonably positive development. "Do horses run on rocks? Does one plow there with oxen? And the fruit of righteousness into wormwood,"
From time to time (typically about once a quarter), this author will take a Sunday afternoon walk around the UT-Austin campus; yesterday was one of those times. 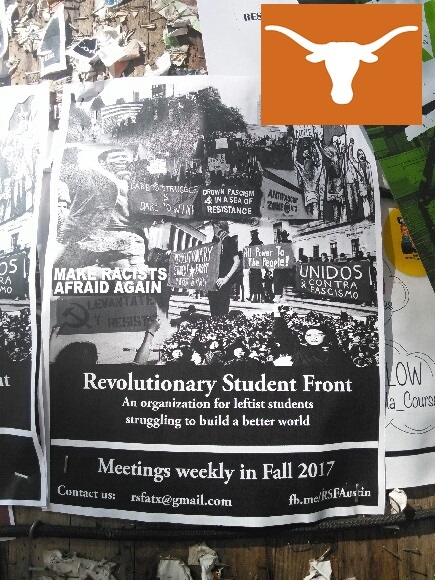 Here's the bad news: We saw the flyer pictured above posted way too many times for comfort, especially around West Mall and Gregory Gym. So, apparently, violent communist revolutionaries are now recruiting at our state's flagship public university and are planning to have a very active presence in the Fall 2017 semester. That's every bit as awful and dangerous as you think. It gets worse: This development comes on the heels of two on campus murders in 13 months. Late last semester, we also saw the emergence of politically motivated left wing vandalism against fraternities. The path of present trends is obvious. We'll make another morbid prediction: It would not surprise this website to see the body count (currently at two) rise. But, for as awful as this fall portends to be, it also makes us weirdly optimistic over the longer term. The reason why is that, as these events unfold, we suspect Fox News will cover them. And we all understand the degree to which a certain Governor cares what Fox News thinks. And, as Fox News covers the worsening climate of left wing violence, Greg Abbott's previous wink-and-nod attitude toward the status quo crowd at UT will become no longer politically tenable. Furthermore, we suspect that if the University publicly embarrasses Greg Abbott, Abbott's will crack down on them with the same focused diligence with which he's pursuing the cities during the special session. If there's one thing we've learned about this Governor in the last month, it's that he doesn't take kindly to being publicly embarrassed by left wing bureaucrats with a sense of entitlement. They flatter with their tongue." We will confess to having mixed feelings about the Health Care bill currently winding its way through the United States Senate. On the one hand, it's obviously a betrayal of any number of GOP campaign promises. On the other hand, GOP betrayal of campaign promises is nothing new, and we think a case can be made for banking what's currently on the table then coming back and asking for more in the next round. 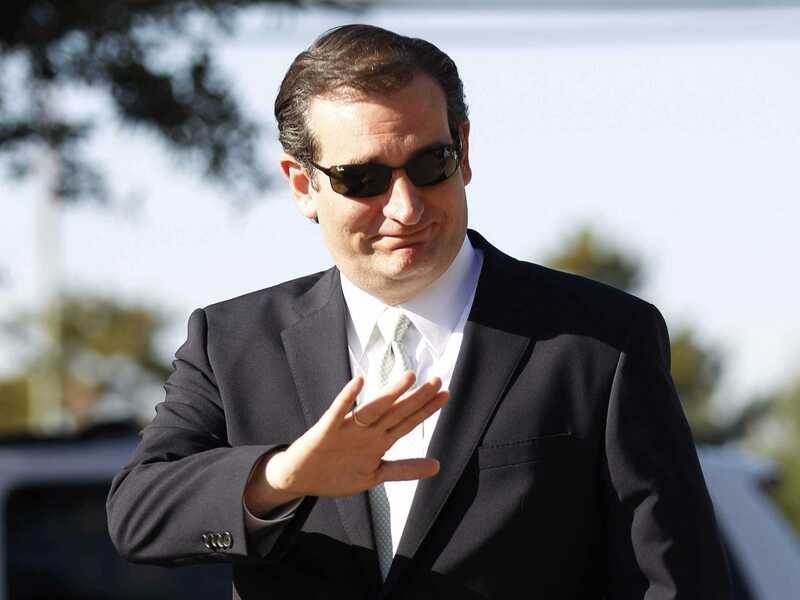 But either way, today's Dallas Morning News article about Ted Cruz allegedly threatening his 'new reputation as a deal maker' in the U.S. Senate is cute. WASHINGTON — The agitator. The obstructionist. The bomb-thrower. All of those depictions of Sen. Ted Cruz were ripe to be dusted off Thursday as the Texan joined three other Republican senators in jeopardizing the Senate GOP’s Obamacare replacement plan by announcing opposition to the bill just hours after it was released. Much has been made in recent months about Cruz’s emergence as a team player, a truly foreign role for the one-time presidential contender who staked his outsider credentials on bucking GOP leadership with theatrics like trying to shut down the government. His latest gambit — which stands in stark contrast to the approach of his fellow Texan, Sen. John Cornyn — puts that charm offensive to the test. The article then goes on to detail of the "oh so important" relationships Cruz could be jeopardizing; in paragraph 21, they finally get around to mentioning that Cruz has a very tangible path to yes. To cut off the remembrance of them from the earth." Austin ISD just passed a budget for HOW MUCH...and they want to issue bonds for HOW MUCH?!? The $1.46 billion dollar budget was approved much quicker than anticipated with the discussion only lasting about 10 minutes. The vote went 7-0-2, with two board members abstained. While we're on the subject, however, there's one point we need to re-emphasize: This is exactly what you should expect to happen when three of the trustees run unopposed. * - Keep in mind, that's only principal and doesn't include interest or cost overruns. Mark Jones is a political science professor at Rice University. Every odd numbered year, he produces a non partisan index that ranks the members of the Texas Legislature from left to right. Jones' index is worth investing some time into because, while the methodology is more complicated than some other groups, it's the most comprehensive analysis of individual members of the Texas Legislature. Note: Click on the image to enlarge. Freedom caucus (predictably) solidify their position as the 12 most conservative House members. 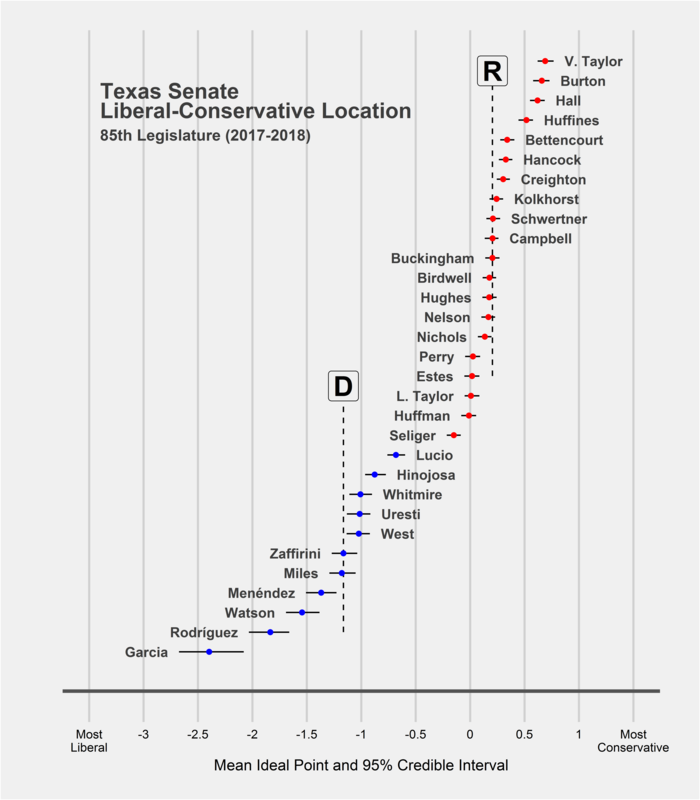 Kel Seliger is the most liberal Republican in the Texas Senate; over half of the Republican caucus in the House is more liberal than Seliger. In the House, we would give every member from Rodney Anderson up a passing grade on voting record; that's 31 members out of a 95 member Republican caucus. However, even among those 31 members with passing grades on their voting record, there are three (Drew Springer, Dennis Bonnen, and Larry Phillips) who receive automatic F's based on other shady actions; so 28 members out of a 95 member House Republican caucus ultimately receive passing grades. 26 Republican House members have more liberal voting records than Byron Cook; chew on that one for a second. Jason Isaac moves significantly to the right from 2015 to 2017; this is consistent with a number of observations we made during the session. In the other direction, Jodie Laubenberg, James White, Giovanni Capriglione, Tan Parker, and Phil King continued their multi-session leftward drift. Speaking of leftward drift, Dan Flynn is now in the bottom half of House Republicans. On Monday, we discussed how the leftward march of the pro-status quo crowd was playing with fire; on that note, we find the fact that in both chambers Democrats from the Valley (which has been trending Republican for a decade) voted to the right of their counterparts in the big urban counties to be fascinating. Rafael Anchia and Chris Turner both rank significantly to the left of the average Democrat in the House...are they sure those are the two guys they want to make spokespeople for their entire party?!? On the Senate side, all Republicans elected in the past 7 years are significantly to the right of the person they replaced. Update: We suppose that technically Paul Bettencourt is about even with the guy he replaced in SD-7. Charles Perry and Larry Taylor both have voting records to the left of Bob Nichols; while people shouldn't overreact, this is a trend worth monitoring. Joan Huffman as the second most liberal Senate Republican might be flying a little too close to the sun for her own good in her re-elect cycle. Read the full report (including a detailed discussion of methodology) for the House here and the Senate here. Regarding constitutional carry, one reality has guided our thinking since the end of the regular session: According to several private conversations with knowledgeable sources, we are at least four votes short in the Texas Senate. Thus, this issue has struck us as one that just requires one more election cycle before it becomes a realistic possibility. During a special session that already features more issues than we will have the bandwidth to cover, it has struck us as prudent to save this one for 2019. But last week's Congressional shooting changed our thinking. Since then, we can't escape the following conclusion: In a world where politically motivated assassination attempts are a contingency for which we must prepare, what if removing barriers to entry for lawful firearms ownership prevents (or even minimizes) one tragedy?!? It would be hard to live with ourself if we didn't try. We want to make one thing clear: During the special session, this author will almost certainly not have time to work this issue. Thus, even if it does get added to the call, don't expect to hear a lot about it here. But this issue has a corps of very committed activists and the truth is that our personal participation is not necessary. Furthermore, from a political perspective, there's also the fact that during a special session you only need 16 votes to pass a bill in the Senate. Thus Kel Seliger, Bob Nichols, Joan Huffman, and Craig Estes would be free to vote no. While holding the other 16 Senate Republicans isn't necessarily a slam dunk, it does strike this website as a realistic possibility. Bottom Line: Even if this author has personal bandwidth limitations, this issue really should get added to the call. Nor oppress the afflicted at the gate;"
Since Governor Abbott called the special session, we've noticed a recurring talking point. "So many of the things listed here are attacks on Austin, not just in the traditional Austin-bashing sense, but on cities generally because we pose a threat in the long term,"
“The list of proposed topics for a special session represents an all-out assault on the ability of Texas voters to decide what’s best for their communities and their neighborhoods. We've also heard similar rhetoric from local officials in (at least) Houston and Dallas. This is worth considering in full, because the argument contains a kernel of truth wrapped in hysterical misdirection. The short version is that these politicians (and their taxpayer funded lobbyists) have everything backwards. While nobody denies the potential long term political implications of the special session agenda, that's a secondary concern compared to the fact that municpal governments across this state have been abusing their citizens can the Texas legislature has jurisdiction to reign them in. Texas has the fourth highest property taxes in the country and the highest property taxes of any state that doesn't have an income tax. Texas has the second highest local government debt in the country. These two are worth considering on their own, because they're obvious macroeconomic storms gathering on the medium term horizon. Left unchecked, local government debt and the property tax system will strangle the state's economy. Does anyone (Note: Who isn't paid to say otherwise) seriously think reigning in these practices is a bad thing?!? The evils of non-consensual annexation, especially in Bexar and Harris counties, speak for themselves. In Austin, the permitting process for residential construction is so complicated and convoluted that council created a pay to play fast lane for the big developers...which they subsequently loaded up with a new round of complicated conditions. Houston's and Dallas' astonishingly high pension liabilities. Even in allegedly conservative cities like Frisco and Plano, property tax collections have been growing faster than the ability of homeowners to pay them. Also in Austin, while issues like the tree ordinance and short term rentals (note: that's going to be a germane amendment on some bill during the special) get the most attention, the anti-property rights orientation of the municipal government has become so pervasive that the code department is performing SWAT-team raids. Again...does anyone seriously think reigning in these practices is a bad thing?!? But you want to talk politics?!? Fine, let's talk politics. We've been saying since 2013 that, while punks like Battleground Texas would never turn Texas blue, the unchecked growth of government at the local level is the one thing that could swing the state over the long run. While a certain amount of boutique progressivism has crept in over the past decade, historically the backbone of the left-wing coalition has been people who collect checks from the government (ie. bureaucrats, lobbyists, and welfare recipients). Naturally, it follows that if there are fewer people collecting checks from the government, there will be fewer constituencies for left wing policies. 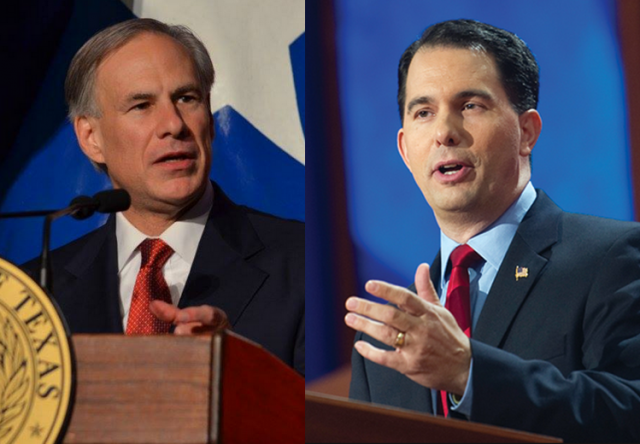 There's a reason why we compared Governor Abbott's special session agenda to Scott Walker's in Wisconsin. Put differently: This website is primarily interested in lowering our personal cost of living, but if we can simultaneously make it easier to win elections 10 years down the line, that's certainly a bonus we'll take. Bottom Line: It's time to reign in abusive municipal governments for the sake of reigning in abusive municipal governments; if doing so also makes it easier to win elections in a decade, so much the better. And the eyes of the lofty shall be humbled." EVERY ASPECT OF THE SANCTUARY CITIES BILL IS POLLING NORTH OF 50%. Newsflash to Joe Straus, Mayor Adler, Rafael Anchia, the Democrats, and the Austin Lobby: THIS IS A POPULAR BILL. Requiring local police to work with Immigration authorities is approved by 58% of voters and only disapproved by 33%...do you really want to take the 33% side in a statewide campaign?!? Also, bear in mind that this poll was conducted at peak hysteria related to the Rinaldi/Poncho incident...which means that, even with full race card guns blazing, every aspect of this law polls at 53% or higher. 77% of voters support statewide limits on property taxes. 63% OF DEMOCRATS support statewide limits on property taxes. NEWSFLASH MAYOR ADLER (you too Sylvester Turner). While they didn't poll support/opposition to the bathroom bill (Note: That's revealing in and of itself), we find it notable that 35% OF DEMOCRATS list it as an important priority. Furthermore, as it relates to the special session, allow us to one more observation that should be obvious: Because Greg Abbott is Greg Abbott, you know he polled every single issue on the call; that he's pushing forward with them should tell you everything you need to know about what his polling said. Is Austin ISD Bullying Engineers to invent support for bond?!? Decision to close T.A. Brown was "a political move designed to build support for a bond campaign." "I think it was political theater and I don't appreciate it." "The district was putting pressure on engineers to exaggerate their interpretation of the studies." Parents of students at the school agree with Zimmerman. Austin ISD declines to comment. "Remember those who rule over you, who have spoken the word of God to you, whose faith follow, considering the outcome of their conduct." This is a savvy move for Dickey; while there are certain obvious political conclusions that can be drawn, it's more notable for the fact that it happened at all. One would think this would constitute the basic blocking and tackling of running a political party. Unfortunately, that's not been the case before, but we suppose better late than never. We also find it notable that the Texas Tribune has yet to report on this topic. For an organization who usually prides itself on being the first to report breaking information, it seems...odd...that they would overlook this one. Readers can ask them why on Twitter. Bottom Line: It'll be interesting to see how this unfolds, but Dickey's action strikes this website as constructive preparation for the special session. Straus opened his remarks with a joke about an optimistic boy who surprises his psychiatrist when he gets excited by "a room full of horse manure." "The boy said, 'With all this manure, there must be a pony in here somewhere,'" Straus said, adding in his own voice, "So I'm going to take the optimistic approach to the special session" — he was interrupted by laughs — "and keep looking for that pony." First things first, this is an old Reagan joke. We don't know if it was Straus or the Trib who neglected to mention that. But either way, it's notable that Reagan was left out of the final write up.. In other words, heading into a extraordinarily high profile special session, he just compared the Governor's agenda to horse manure. While Straus has previously undermined Abbott's priorities, outright insults represent an escalation. We suspect the Governor will not overlook this indefinitely. Additionally, Straus made conventional liberal arguments about how there's no problem in the socialized education system that MOAR MONEY (tm) can't fix. Also, having the state pour additional billions into the socialized education without meaningful reforms will TOTALLY lower property taxes! Finally, he made some choice comments about the privacy act. Abbott drew national attention in 2015 when he announced that the depository would allow Texas to “repatriate” $1 billion in gold bullion currently being stored in New York. 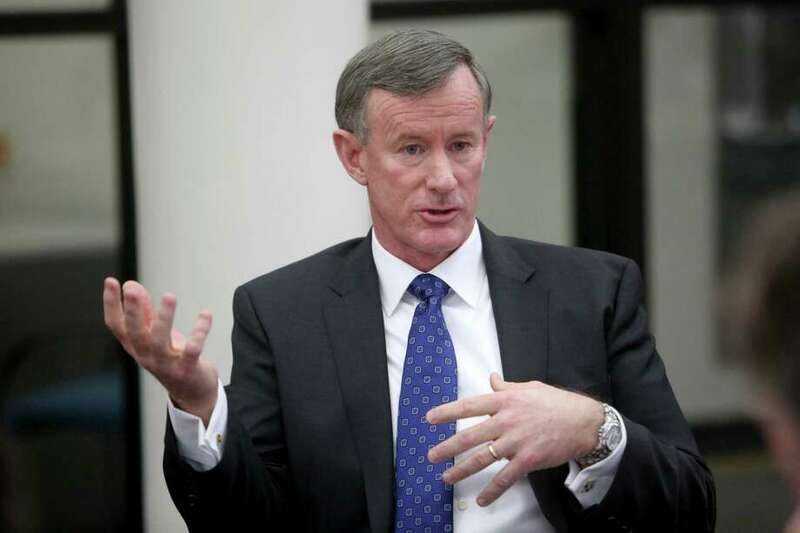 He was referring to gold bullion assets held by the University of Texas Investment Management Company, which oversees the assets of both the University of Texas and Texas A&M systems. The nonprofit currently has $861.4 million worth of gold bullion in storage at the HSBC Bank in New York City, according to Jenny LaCoste-Caputo, a spokeswoman for the UT system. But UTIMCO officials appear unlikely to move their gold holdings to the state depository. Officials there have previously said the Texas depository would have to be a member of the Chicago Mercantile Exchange’s COMEX platform, where gold futures contracts are traded. LaCoste-Caputo confirmed Tuesday that that condition still holds. The new state depository will not be a member of COMEX, according to Matthew Ferris, chairman of Lone Star Tangible Assets. He pointed to geographical limitations as preventing the Texas Bullion Depository from joining. “Ultimately, our goal is to create liquidity of COMEX levels in the state of Texas for those large institutions over time,” Ferris said. LaCoste-Caputo also said that gold storage fees UTIMCO pays would have to be cheaper at the Texas depository than it currently pays in New York for the organization to make the switch. Soo...they're going to openly defy the Governor over something this big?!? Keep in mind: This is the Governor who has done nothing but protect them during his time in office. This is the Governor who fast tracked getting Wallace Hall off of the Board of Regents. And this is how they repay him?!? And this is after they already attempted to defy him over the Houston land grab. Bottom Line: If they move forward with this plan, the next round of regent nominations is going to be VERY interesting (*). * - We doubt WH would accept a re-nomination to the Board if it were offered, but nominees of a similar philosophical disposition are a realistic possibility. "knowing this: that the law is not made for a righteous person, but for the lawless and insubordinate, for the ungodly and for sinners, for the unholy and profane, for murderers of fathers and murderers of mothers, for manslayers,"
Jimmy Galindo, the former West Texas official accused of splitting about $850,000 in bribes with state Sen. Carlos Uresti, pleaded guilty Monday in U.S. District Court in San Antonio. Galindo, who was county judge of Reeves County from January 1995 to December 2006, pleaded guilty to conspiracy to commit bribery and failure to file a 2013 tax return. Galindo, 53, struck a deal with federal prosecutors May 18, agreeing to “fully cooperate in the investigation and prosecution of any and all criminal transactions known to the defendant,” including the case against Uresti. Uresti, the San Antonio Democrat serving Senate District 19, is accused of using his consulting company, Turning Point Strategies, and his law firm’s bank accounts to pay Galindo his share of the bribes they received from a Lubbock businessman. Uresti, 53, and Farthing, 44, were indicted by a federal grand jury May 16 on charges of conspiracy to commit bribery and conspiracy to commit money laundering. They have each entered not-guilty pleas. 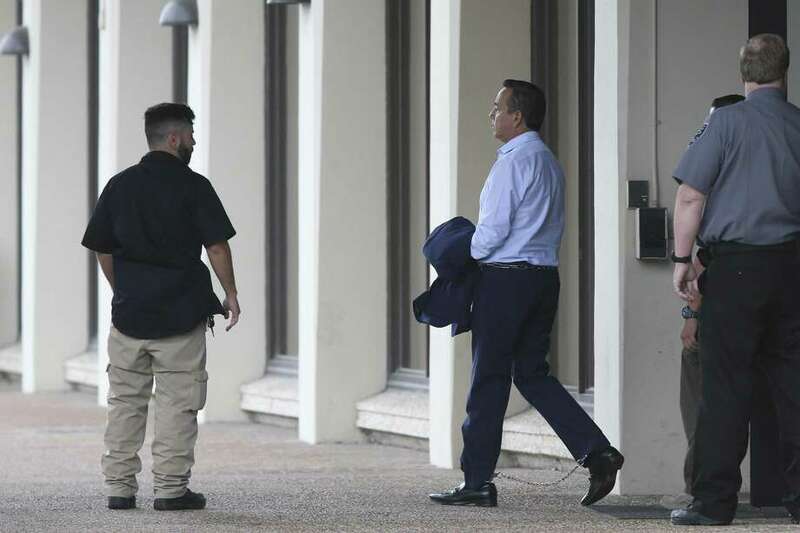 Separately, Uresti faces 13 charges carrying more than 200 years in prison over his involvement in FourWinds Logistics, a bankrupt oil field services company for which he provided legal services and received commissions for attracting investors. Uresti also has pleaded not guilty to those charges, which include securities fraud and wire fraud. Meanwhile, Uresti has asked for a continuance in both his cases, which are slated for trial next month, because Gov. 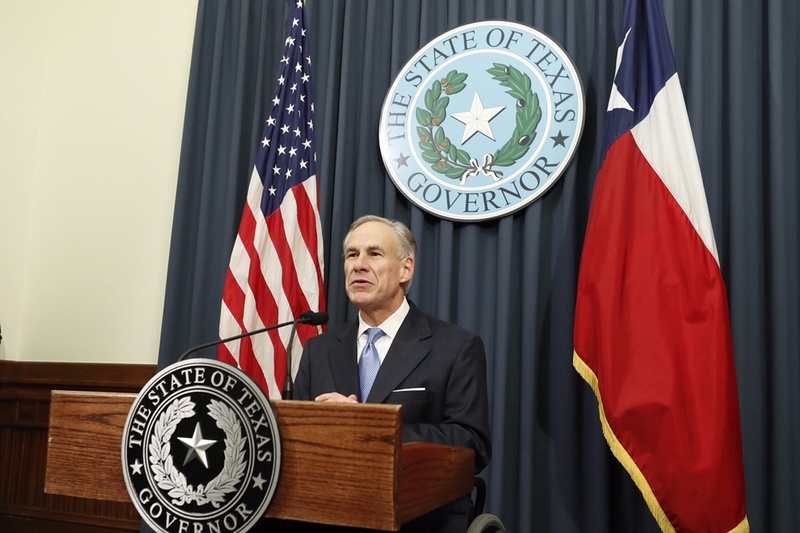 Greg Abbott called a special legislative session that is scheduled to start July 18. The continuance means this probably won't have much of an impact in the special session, but consider the following: If Uresti is convicted, there will have to be a special election to fill the remainder of his term...and it's not crazy to think that a Republican could win District 19 in a special election. But he who heeds counsel is wise." If you listen to Gov. Abbott’s words (not what the media says he said), the Governor set the floor – not the ceiling – on many of these issues. When he actually issues the official proclamation for the special session, we will then know the exact wording – how narrowly or broadly – he defines the scope of each topic. Don’t forget the Governor can add issues to the special session during the special session. He can also call subsequent special sessions. During a press conference with reporters, Gov. Abbott announced through legislation he’d like to give every Texas public school teacher a $1-thousand raise. 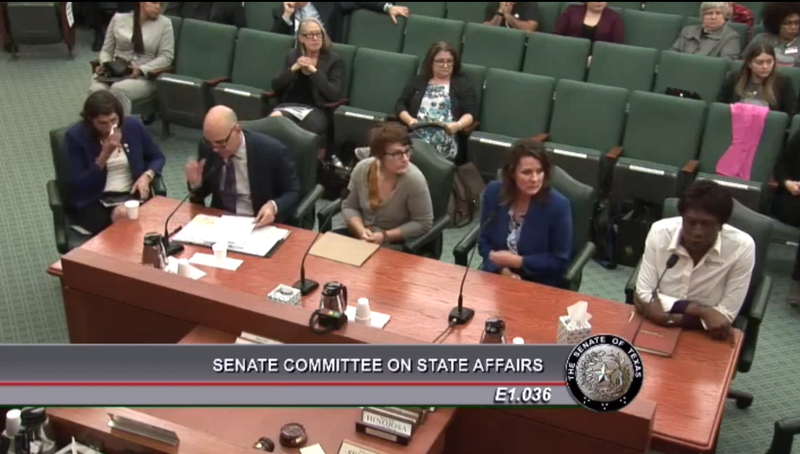 But Dax Gonzalez with the Texas Association of School Boards says without any new state funds added to that directive, schools would be essentially using existing local resources to afford that raise. “Trying to squeeze an extra thousand dollars per employee, per teacher, out of a budget that already is 85-percent personnel salaries, you’re really asking districts to go beyond where many I think can,” Gonzalez says. Bottom Line: That they're playing this dirty this early tells you everything you need to know about how threatened they feel. But those of everyone who is hasty, surely to poverty." Having had a couple days to digest Governor Abbott's special session call, we keep returning to one inescapable conclusion: This is what Scott Walker did in Wisconsin...on super-duper steroids. 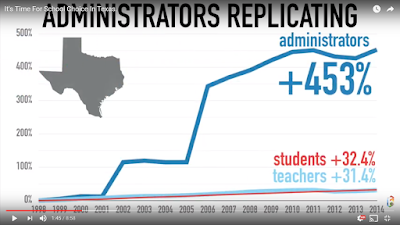 Administrative flexibility in teacher hiring and retention practices. Allowing parents of special needs children to use public school dollars for private schools. Limiting growth of local property taxes. 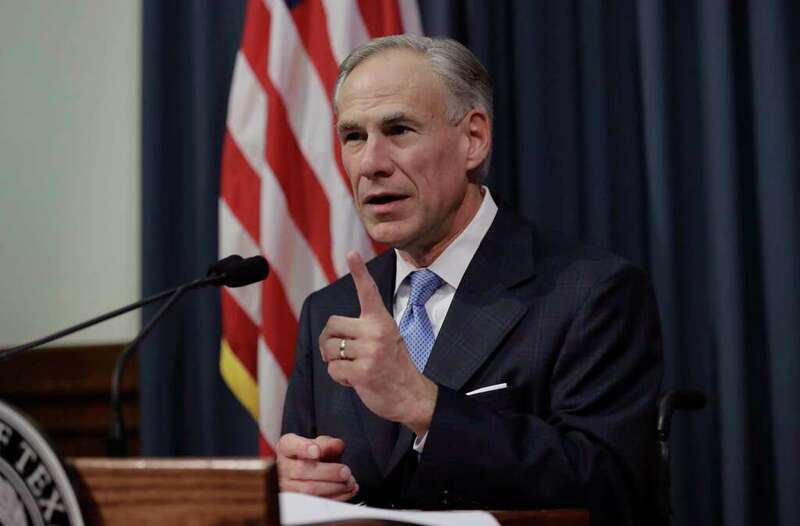 Note: In his press conference Tuesday, Governor Abbott said "SB 2 or better." Caps on state and local spending. Preventing cities from regulating what property owners do with trees on private land. Preventing local governments from changing rules midway through construction projects. Speeding up local government permitting process. Restrict cities' ability to annex property. Preempting local restrictions on mobile devices in automobiles. Note: In other words, in exchange for a fairly toothless statewide bill, he's going to nuke the local revenue collection racket. Prohibiting public employers from collecting union dues. Prohibiting local governments from sending tax dollars to abortion providers. What do each of these 11 items have in common?!? They significantly weaken the various and sundry bureaucracies that send taxpayer funded lobbyists to the Capitol. And, as these bureaucracies are weakened, their ability to buy votes and plague future legislative sessions similarly declines. Think about it this way: It'll be a lot easier to eliminate property taxes in 2019 or 2021 if the cities and counties have been forced to live under spending caps for 2 or 4 years. Likewise, on the education side, "administrative flexibility" is a marvelous euphemism for taking a bite out of the socialized education industrial complex...which means it'll be a lot easier to pass a significant education reform measure in 2 or 4 years. Finally, if these fiscal restraints come to pass, we doubt the cities will retain the basic bandwidth to fight constitutional carry in future sessions. And that's before we consider the political impact of the union dues bill, which people don't fully comprehend. If the union dues bill passes then over the next decade Harris County will turn solidly red, Dallas County will turn purple, and even Travis County will become a significantly lighter shade of blue. Furthermore, given everything else on the special session agenda, we don't think Joe Straus has enough political capital left to kill this a third time. As noted above, there's a political model: It's called Wisconsin. There, by confronting and defunding the institutional left, Scott Walker turned a solidly blue state into a solidly (if narrowly) red state over the course of four election cycles (ie. it didn't happen overnight). And a similar phenomenon, only supercharged, will take place in Texas if we're smart enough to take the first step during this special session. Now, obviously, these items need to pass. Equally obvious, given that we're talking about the Texas legislature, we expect House leadership to commit copious amounts of villany attempting to derail them. But our gut says that House leadership's top priority will be to kill the bathroom bill, and that in order to accomplish that objective they're going to have to let a boatload of this fiscal stuff through. And the fiscal stuff is game changing. 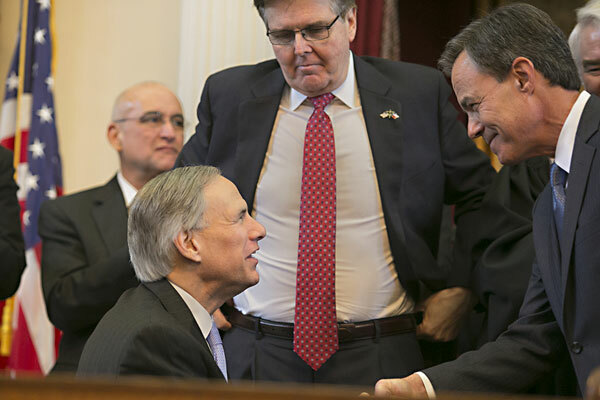 We're still in the process of digesting Governor Abbott's special session call, but so far two phrases come to mind: "Better late than never" and "Trust, but verify." However we got here, there's a lot to like in this agenda. No, everyone's pet issue was not included in the call. But there are several items that, if successful, would be game changers. Consider two items: local spending caps and ending mandatory union dues. If successful, they would permanently alter the relationship between productive citizens and a predatory "public sector." To understand the long term impact of such a transformation, look at Wisconsin. Put differently, we think the unhinged hysteria with which our local #atxcouncil reacted speaks for itself. Now, obviously, these items need to pass. Equally obvious, given that we're discussing the Texas Legislature, the status quo crowd will engage in chicanery and villainy to attempt to derail them. But Governor Abbott just took a pretty big risk, which means he's got an investment to protect. And for Joe Straus to kill all 19 of these items strikes this website as a tall order. Bottom Line: We're either going to come out of this special session with a bunch of policy victories or a bunch of campaign issues; while the former is vastly preferable to the latter, either one is a win. "But the wheat and the spelt were not struck, for they are late crops." We are either in favor of, or neutral on, every item on this list; there's nothing on here we're against. We've heard speculation that Abbott's plan is to get the Senate to give up its leverage on the sunset bill, then send them all home. We don't believe that because you simply can't pull a bait and switch like that on people. He literally said he intends "to make it count." Joe Straus can't kill all of this. Adding 19 items "for the House and Senate to vote on." Parsing his talk about teacher pay raises and "administrative flexibility" it looks like he's calling to take money out of the bureaucracy and put it in the classroom. "I want legislation on my desk." "Texas doesn't need to spend more, we just need to spend smarter." "We can do that without taxpayers spending a penny more." School Finance: "We spend too much money on bureaucracy and overhead." See what we said here. Property Taxes: SB 2 or better. State AND Local spending caps!!! This would change the world. Austin: "Doing everything they can to overregulate." The permitting stuff (and, to a lesser degree, the rule changing stuff) would cause housing costs in Austin to plummet. Involuntary Annexation: "Piracy by government." We might not be crazy about the state texting while driving ban, but in exchange for nuking all the local ordinances it's a good trade. If Joe Straus wants to kill the bathroom bill, he's gonna have to pass a whole smorgasbord of game changing fiscal bills. Union dues bill: This is the poor man's version of banning taxpayer funded lobbying, but it's a damn good start. "Legislators have six weeks to prepare for the special session." "If they fail, it will not be for a lack of time, but for a lack of will." Note: Only time will tell, but this sounded an awfully lot like a veiled threat to campaign against obstructionist legislators. The taxpayer funded lobbyists are going to have their hands full. Today was not a good day for Joe Straus. In a single press conference, @GregAbbott_TX set stage for the biggest pro-taxpayer victories in... maybe ever. Will #txlege House go along? Bottom Line: Just because an item was put on the call doesn't necessarily mean it'll pass, but with diligence and focus a whole lot of them can. Empower Texans has more here, the Statesman has more here, the Trib has more here. It's that time of the political cycle! The regular session of the 85th Texas Legislature is over. How'd they do?!? Border Security: B -- They passed the Sanctuary cities bill and maintained border security funding in the budget; if border security is one of your top issues, you can't deny that they made tangible progress on this issue this session. But we've publicly stated doubts about whether the approach behind the sanctuary cities bill will ultimately accomplish it's stated objective, and we've found the discussion to be very theatrical. In other words, they notched a couple of first downs but missed other opportunities to reach the end zone. Pro-Life: B -- The top realistically achievable pro-life priority, the dismemberment abortion ban, was successful. In addition, we had a couple of pro-life victories in the budget. 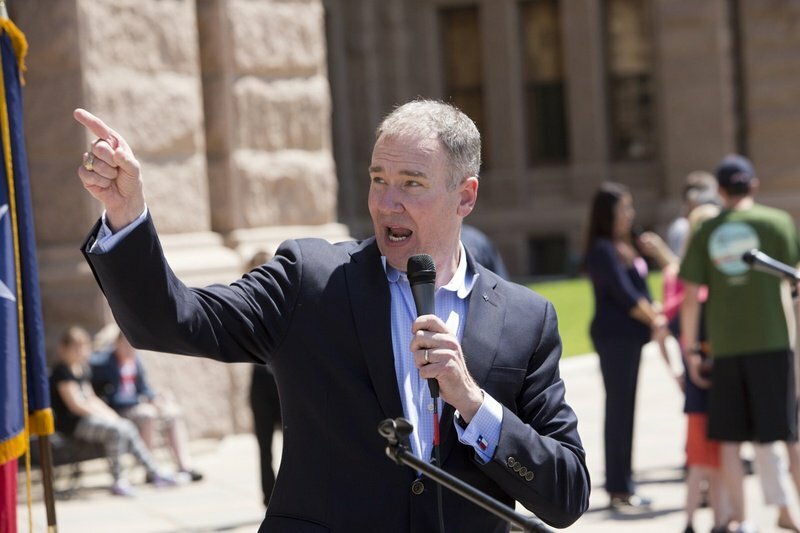 But we'll repeat what we said two years ago: "The only reason meaningful pro-Life legislation passed this session was the dogged and indefatigable work of Texas Right to Life." 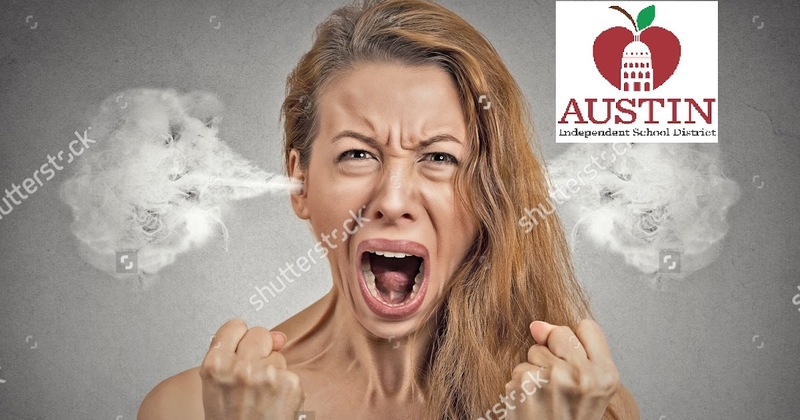 Unfortunately, for no reason besides political spite, House leadership killed efforts to eliminate abortion subsidies in the health insurance market and to prohibit involuntary due not resuscitate orders in hospitals. Finally, while it had no realistic path to 76 votes, for Byron Cook to kill the abolition bill without a hearing speaks for itself. Austin Bashing: C -- The Uber bill crossed the finish line. On housing issues, they lost linkage fees. And it's not a secret that a number of local politicians have cynically grandstanded over sanctuary cities. But the overwhelming majority of bills to reign in the City of Austin's abusive practices died in House committees chaired by Democrats. Pro-property rights bills related to historical zoning and short term rentals died in Carol Alvarado's Urban Affairs committee, while bills to stop micromanaging hiring practices and pre-empt tree cutting ordinances were slow walked in Rene Olivera's Business and Industry committee. Alvarado and Olivera killed several other bills without hearings. It's worth noting that none of Paul Workman's Austin bashing bills were successful. Finally, an attempt to prohibit other forms of housing price controls died late in the Senate. Religious Liberty: C -- Conscience protections for adoption service providers successfully passed and that's a pretty big deal. In addition, efforts to reign in some of the most abusive actions we saw in the 2014/15 Houston saga were successful. Both of those are fairly substantial victories. But any number of other religious liberty bills died in the House. It wasn't terrible, but it was underwhelming. Higher Education: D [Note: Senate C, House F] -- The good news: The Senate passed strong bills on tuition and free speech. Unfortunately, both predictably died in the House. Nevertheless, those Senate bills are a solid foundation from which to build in future sessions. The bad news: In the one place where the Senate had leverage and the House was irrelevant...the Senate rubber stamped the damn regent nominees. Thus, we expect the higher ed. status quo to continue in the short term. In addition, the Senate caved and increased higher ed. funding in the budget. The only reason we're giving them a passing grade is because UT had to back down on the Houston land grab. Ethics: D [Note: Senate A, House D] -- The first bill the Senate unanimously passed was an ethics bill that would have accomplished the following objectives: "barring politicians convicted of a felony from holding office or drawing a pension, requiring lawmakers to disclose government contracts, bond counsel, and legal referral fees, enacting more effective disclosure of lobbyist wining and dining of legislators, and banning elected officials from being employed as lobbyists while in office and eliminating the “revolving door” by adding a one session cooling-off period before former lawmakers can become lobbyists." In addition, the Senate began the process of reigning in taxpayer funded lobbying. Over the course of this session we have become convinced that eliminating taxpayer funded lobbying is, by far, the most important ethics reform the legislature could make. Unfortunately, the only parts of that package that survived the House were the parts about barring pensions for convicted felons and a watered down form of contract disclosure. Finally, it's worth noting the degree to which the House has treated Greg Abbott with contempt over this topic. For the past two sessions, the Guvnah has made ethics reform an emergency item, to only receive the crumbs from House leadership we detailed in the preceding paragraph. That Abbott won't even fight for his own stated priorities is quite revealing. Two Year Budget: D -- We said our piece about the budget two weeks ago but the TL,DR version is that the this budget met the bare minimum standard (kept the top line number under inflation+population growth) but went no further and funded a lot of garbage. Tax Relief: F [Note: Senate B, House F] In one of the highest profile discussions of the session, the Senate passed a bill that would have begun the process of structurally reforming the property tax system; the Senate bill didn't go far enough, but it was a fairly significant step in the right direction. 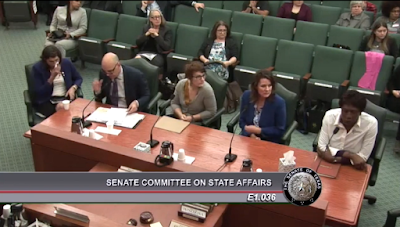 Unfortunately, due to a combination of incompetence and mendacity from Ways and Means chairman Dennis Bonnen, that effort collapsed in the House; we detailed Dennis Bonnen's debacle in real time. They didn't even get margins tax elimination across the finish line. Second Amendment: F -- Constitutional carry remains undone. Mom's Demand Action bragged about having a successful session. Case closed. Education: F [Note: Senate A-, House F] -- While they had to modestly water it down to get to 19 votes, the Senate passed the strongest parental educational choice bill the legislature has ever considered. 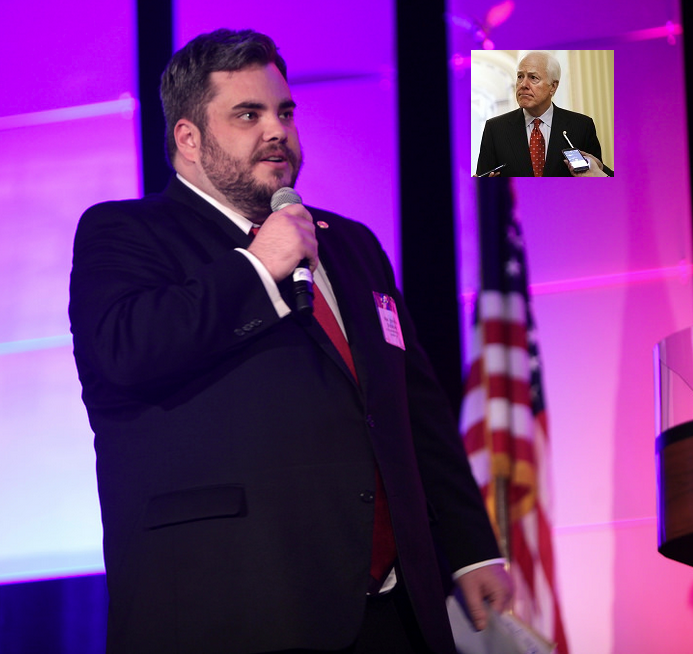 In the House, Chairman Dan Huberty thumbed his nose at the Republican party platform and killed parental choice. The House followed up with a budget vote that further illustrated their loyalty to government bureaucrats over parents and children. Huberty also attempted to use a shady process to pass a "school finance" bill that would have accomplished little besides pouring additional money into the same failing system. The only silver lining is that when the school finance bill made it to the Senate, they rewrote it in a way that might point the way towards a long term compromise. 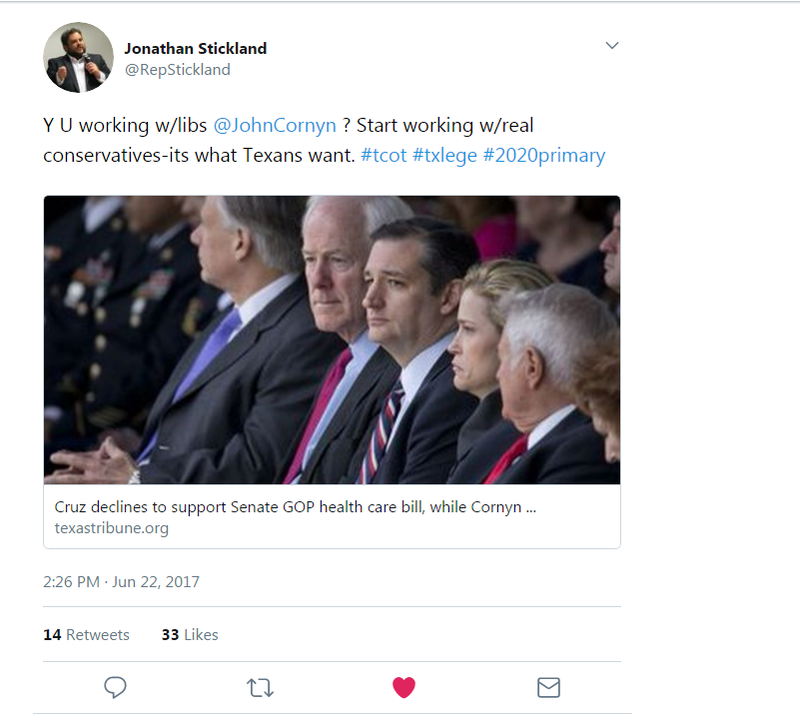 "Fit hits the Shan" Preparation: F -- For as little as was getting done this session, we thought there was a decent chance grid security could pass, but it ultimately didn't; right to use cash legislation and the Texas Sovereignty act similarly died. Structural Fiscal Reforms: F [Note: Senate A, House F] -- For future state budgets, the Senate passed a strong spending limit bill in late March. In addition, the Senate took a hard look at various corporate welfare programs, 'economic development' shenanigans at the local level, and ballot integrity for local bond elections; these are a strong foundation on which to build future efforts. None of these efforts went anywhere in the House. Transportation: Incomplete -- As far as we can tell they didn't do anything terrible (though they tried), but neither did they do anything particularly good. Overall, we would give the Senate a B and the House an F.
Bottom Line: The good news is that most of the bad stuff died; the bad news is that most of the good stuff also died.